If you love IKEA for their cheap furniture, you’d probably love them even more after discovering the huge possibilities they provide for creating lighting modifiers. (Beauty Dish, Ring Light and even a DSLR shoulder rig are some of the projects we covered so far). 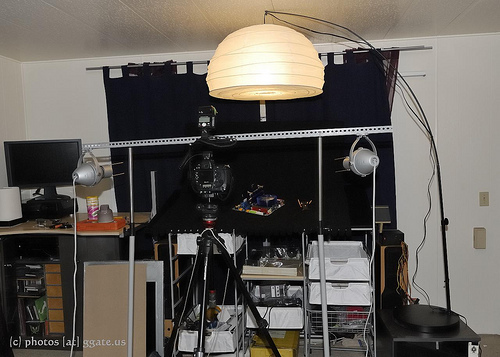 In this project Andy Kubbat takes us through the process of building an overhead bare bulb light fixture using a strobe and an IKEA Regolit Floor Lamp priced at $49.99. Regolit hacking: My Nikon flash with batteries (and diffuser) is pretty heavy. 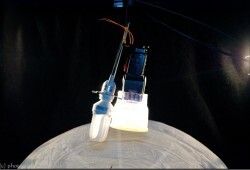 And despite a really heavy foot (~10kg), the lamp would tip over when fully extended. True to IKEAHACK‘s spirit, it is possible to omit some pieces in that lengthy arm — at the expense of height & reach. Strobe location and triggering: Mounting the SB-600/SB-800 flash was not that difficult — using some cable straps and the foot that comes with the flash, I tied that foot to the top of the lamp shade. The flash can be completely inside — the light pulses to trigger penetrate the shade so you can set the SB-600 as a slave and use Nikon’s CLS to adjust the output from the camera without ever touching the flash inside the shade. While that worked nicely, I prefer the increased flexibility of manual mode (0EV…-7EV power vs 0..-3EV via CLS) and a SB-800 set to SU-4 mode (trigger when any external flash goes off) worked better for me. In the end, I didn’t pull the lamp shade all the way up into its original position and instead attached the top of the shade to the middle of the flash, so the flash head was inside the shade, while the control panel was outside. Moving around: I’ve mounted the Regolit on a small coffee-table with wheels giving it the necessary height and added mobility, and room for more accessories.